The trailer which tries to bring back the classic love stories of the ancient time may cause goosebumps all over your skin and the first word after watching the trailer for the very fist time would be surely a 'WOW'! The trailer of 'Raabta', one of the much awaited films of the year is finally out now. After announcing the date of the trailer launch with a rather interesting video featuring Sushant and Kriti, the final trailer is being released on Monday afternoon. The trailer which tries to bring back the classic love stories of the ancient time may cause goosebumps all over your skin and the only word after watching the trailer for the very fist time would be surely a 'WOW'! The film, helmed by Dinesh Ranjan is likely to be a story of re-birth, a time lapse connecting two different eras. Sushant and Kriti in the film will be seen featuring a cute, young couple Saira and Shiv, unknown of the fact that they are already connected with each other through a love story which could not be fulfilled in one life time. 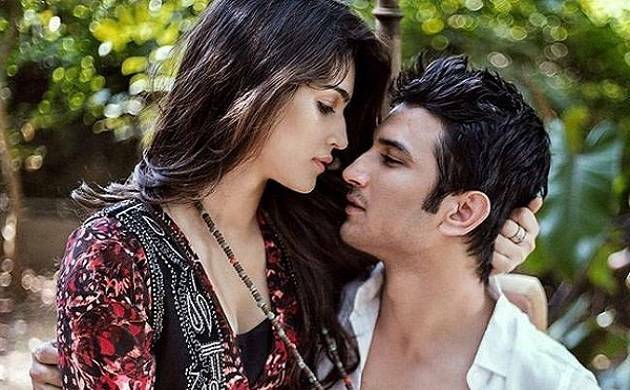 Kriti and Sushant who are creating a buzz for their much rumoured off-screen chemistry in recent times had not missed a single chance to make people love with their first on-screen appearence. Interestingly, a remake version of 'Kuch Toh Hai Tujhse Raabta' the much loved song from 'Agent Vinod' on the background is creating the atmosphere much more lovely and romantic. While the scene of Sushant flirting and making love with Kriti will give you a feel of typical 'Romantic Drama', the trailer will take a complete turn as soon as Jim Sarbh enters the screen. Yes! It is Jim Sarbh who is going to create tension between this cute sweet love story of 'Raja & Rani'. Now June 9 will only answer the much awaited question whether the death of 'Raja' and 'Rani' will give a tragic end to the love story or luck has something else for them in its store. On the work front, while Kriti has bagged several other projects like 'Bareilly Ki Barfi', and 'Maasthi Gudi', Sushant is also busy shooting his forthcoming projects 'Takadum', 'Romeo Akbar Waltet', 'Drive' and many others.